We are restoration specialists and regularly work alongside architects, preservation companies, renovation experts and developers to achieve a high profile finish. Through several technical options, our skilled craftsmen are able to remove years and years of built up paint. 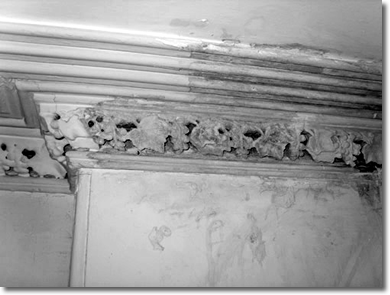 This is an ideal solution and can reveal the original moulding detail lying beneath – perfect for those projects requiring sympathetic restoration. We have a range of specially designed tools which our craftsmen use to restore mouldings. We can expose the traditional beauty of ornate objects around the property, without damaging or marking the item. In addition to restoring mouldings, we draw on a great deal of experience to hand make mouldings to make up complete sets. This is ideal to our clients seeking to replace missing mouldings. Often, items like ceiling roses or cornice parts, get damaged or cracked or are in complete need of reconstructing. Damaged items can be made up accurately using traditional plaster methods - which can be made to match the existing ones exactly. Whether you plan to renovate old mouldings, restore existing ones that are still in their original place, or re-create mouldings, our craftsmen can assist. We invite our clients to speak to us directly by phone, email or by contacting us through our website. We have an extensive portfolio, and can provide past project details along with prompt quotes for your project.